AGADIR, Morocco, June 21, 2010 (ENS) – The worldwide moratorium on commercial whaling that has been in place since 1986 could be overturned this week as the 88 member governments of the International Whaling Commission hold their annual meeting in Agadir amidst accusations of corruption and vote buying. The IWC is expected to vote on a proposal by the Commission’s chairman and vice-chairman that would allow a resumption of commercial whaling in exchange for pledges by three whaling nations – Japan, Norway and Iceland – to reduce the numbers of whales they kill each year. Under negotiation for three years, the proposal would allow limited commercial whaling, giving the three whaling nations permission to take almost 13,000 whales over the next 10 years, including several threatened species. 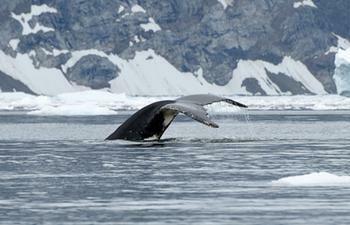 The proposal would allow hunting in the Southern Ocean Sanctuary around Antarctica and approve the killing of whales for commercial purposes by Japan around Antarctica and in the North Pacific. It would add new rights for Japan to hunt whales in its coastal waters and allow continuing whaling by Iceland and Norway, but no other nations would be permitted to begin whaling. Hotly contested by anti-whaling nations such as Australia and Germany, the proposal has attracted the tentative support of Japan and its allies, mostly small island and African nations. The meeting opened this morning behind closed doors without the leadership of IWC Chairman Ambassador Cristian Maquieira of Chile, who has pulled out of the meeting in Morocco due to ill health. The nature of his illness was not specified by the IWC. The meeting is being led by IWC vice-chairman Anthony Liverpool of Antigua and Barbuda, who co-wrote the proposal with Maquieira. But Liverpool’s authority as acting chair and the entire IWC process have been compromised by accusations of corruption which appeared in the “Sunday Times of London” yesterday and June 13. According to the reports, Liverpool and the IWC commissioners of 15 other member countries had their flights, accommodations, per diem, and other meeting expenses paid by representatives of the government of Japan, a conflict of interest that undermines their ability to be fair to both sides. But a Sunday Times reporter posing as a British lobbyist willing to pay IWC member governments to vote against the proposal recorded admissions that those governments feared to lose aid payments from Japan if they did so. Cash and the services of prostitutes were also used to gain their support for Japan on IWC votes, the undercover reporters learned. Such vote buying has long been alleged, but Japanese government representatives have denied employing the practice. The June 13 report prompted a call by a whistleblower to the Greenpeace office in Tokyo to tell the campaign group about his role in Japan’s vote buying operation. The whistleblower revealed that Liverpool’s bill at the Atlas Amadil Beach hotel in Agadir from June 13 to 28 was being paid by Japan Tours and Travel, a firm based in Houston, Texas and linked by a Sunday Times reporter to a Japanese businessman named Hideuki “Harry” Wakasa, who also lives in Houston. The whistleblower last week identified Wakasa as the middleman who paid cash and checks to five east Caribbean island nations, including Antigua. “The acting chair has ordered two further days of closed-door meetings to limit time for open debate, with a view to fast-tracking the proposal when the formal session re-opens on Wednesday,” said Ramage. 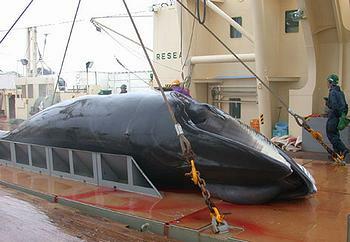 Watson says he will again send ships to the Southern Ocean to intercept Japanese whalers during the next whaling season. But the government of Japan, in a briefing note issued in advance of the IWC meeting in Agadir, again denied that it buys the votes of IWC member governments. “This accusation is false. Japan is one of the world’s largest donors, providing aid to over 150 countries. This aid is not linked to the policies of recipient nations on specific issues. 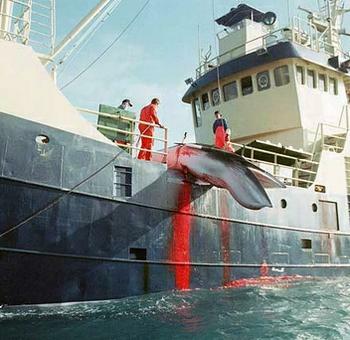 In fact, Japanese aid is provided to a number of countries including Argentina, Brazil, India and Mexico that are opposed to whaling,” Japan said through the Institute of Cetacean Research. 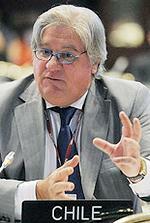 Acting Chair Liverpool has long declared himself as a supporter of whaling. As Antigua and Barbuda’s IWC commissioner at the 2005 meeting in South Korea, he argued that some IWC members of lack respect for cultural traditions and fail to accept the position of coastal communities and small island states to utilize whales for food. However, support for whaling is eroding in some IWC governments, including IWC Chairman Maquieira’s own government, Chile. “This position is totally against the Policy of State of Chile, openly committed to the protection and non-lethal use of whales,” said Senators Guido Girardi of the Party for Democracy and Juan Pablo Letelier of the Socialist Party. They say Maquieira’s position shows “a lack of coordination” with that of Chile’s Minister of Foreign Affairs Alfredo Moreno, who recently stated that the position of ambassador Maquieira does not represent the official position of the Chilean government. Some nations named in the Sunday Times as targets of Japan’s vote-buying bribes denied the accusations. On Wednesday, the Pacific island nation of Kiribati “strongly” denied the allegation. The Marshall Islands foreign minister accused the newspaper of “falsifying” and “distorting” information. The Marshall Islands’ vote at the International Whaling Commission “is not for sale,” Foreign Minister John Silk said in a statement Wednesday. The Marshalls Foreign Ministry acknowledged its “long-standing diplomatic relationship with Japan,” and confirmed it “has received tremendous bilateral assistance from Japan through grants, trainings, economic development projects,” including a new $8 million fish market and a $4 million solar energy project. And on June 16, the German parliament declared that in order for Iceland to be granted membership in the European Union, it must abolish its whaling industry. Monica Medina, the U.S. IWC Commissioner and the Commerce Department’s principal deputy under secretary for oceans and atmosphere, takes the position that the proposal needs improvement. Japan’s position is that, “the 1946 International Convention for the Regulation of Whaling is about properly managing the whaling industry, that is, regulating catch quotas at levels so that whale stocks will not be threatened. The Convention is not about protecting all whales irrespective of their abundance,” the Institute of Cetacean Research said in its briefing note. 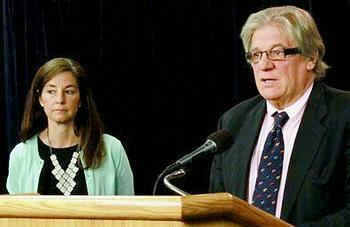 Click here for previous ENS coverage of the 2010 International Whaling Commission meeting.